Protecting the worker is essential when working with biological contaminates. CPR Masks and Bio-Hazard Kits offer excellent protection for responders while providing life-saving resuscitation in emergency situations. Bio-Hazard kits are designed to protect the health of your first responders and assist you when dealing with body fluids and clean up. CPR (Cardio-Pulmonary Resuscitation) keeps oxygenated blood flowing to the brain and heard when a person goes into sudden cardiac arrest (SCA). During SCA, the heart stops and the brain does not receive any oxygen. A CPR kit will help EMS responders, volunteers rescuers, and firefighters in cases of emergencies to help save lives. When responding to emergencies that involve blood and other bodily fluids, a bio hazard kit is essential in the safety of every responder. 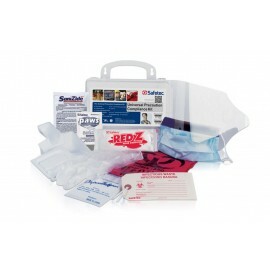 Kits offer more to aid in the cleanup of blood and other bodily fluids than just latex gloves. OSHA regulation 1910.1030 regarding blood-born pathogens states that universal precautions shall be observed to prevent contact with blood or other potentially infectious material. All of our bio hazard kits come with a bio hazard waste bag for safe storage and transportation of infectious materials.